This is the story about a very beautiful and very special mirror. It hung on a wall in the dining room of a fine house belonging to a rich man. The mirror was large and square, with a wide, thick gold frame carved with beautiful designs of leaves and flowers. Everyone that saw the mirror admired it, but everyone also noticed that it was imperfect. On one of the corners, you see, the silver backing had been scraped off so that this part of the mirror was plain glass. People would remark upon its beauty and then say, "Oh, what a pity! Too bad the mirror is damaged." To everyone's surprise, the mirror's owner would tell his visitors that it was he himself who had deliberately scraped the silver backing off! Can you imagine owning such a costly mirror, a work of art, and then ruining it? But let me tell you the story of that mirror. Many years ago, in a small town in Poland, there lived a man called Abraham. He owned a small store and he earned just enough money to take care of his family. He was not a rich man, but he also was not a very, very poor man. He had only a few customers. Sometimes people left without buying anything because Abraham did not have many things to choose from. They went to the big stores instead where they could find what they wanted. Abraham was happy with his life. Though he was not rich, he always had enough to share with others. No visitor that came to his home ever left hungry. Every time a poor person needed help, Abraham always found money to give him. Abraham and his wife lived a very simple life. Their home was small. The house really needed a paint job, but there was never enough money for that. It seemed to them that it was more important to help someone in real trouble than to paint a house. Their furniture was old for the same reason. The curtains on the window had probably been washed a hundred times. Abraham and his wife had no carpets on their floor. Their clothes were plain, and they did not often buy new things. Many of their cups and plates had chips and cracks. The food they ate was simple. Yes, it was not a very fancy home. But it was a real home. It was a warm and happy place. Everyone felt comfortable and relaxed there. Abraham had many visitors because everyone knew that he was kind and liked to be helpful. One day Abraham was standing in the doorway of his little store waiting for customers. Suddenly he noticed a stranger walking toward his store. Abraham lived in a small town so he knew all the people there. When the stranger was near the store, Abraham asked him how he could help. "Maybe you would like to come to my home and rest awhile," he said. "If you are hungry, please be my guest. If you are thirsty, please come with me for something to drink. Perhaps you need money? We will help you." Abraham's invitation was so warm and friendly that the stranger decided to stop in his house for a rest. What Abraham did not know was that this was no ordinary stranger. This was a very holy, wise and famous Rebbe from a town far way. He was on his way to a wedding and happened to pass through Abraham's town. The Rebbe was an important man and many people in Poland traveled long distances to listen to his words of wisdom, or to ask for a blessing or prayer in time of need. It would have been a great honor for any home to have this Rebbe as a guest. The Rebbe soon noticed Abraham's kindness and generosity. He knew many rich people who could have helped the poor much more easily than Abraham, but who did much less than he. The Rebbe enjoyed his short stay. Before he left he blessed Abraham with riches, so that he should be able to continue helping the poor and needy more easily. After the Rebbe left, Abraham's store suddenly became a very busy place. All day long customers were coming in. Everyone found what he wanted, and no longer did people leave his store to shop somewhere else. With each day that passed, Abraham had more new customers and more money to bring home. Soon he had to make his store larger to fit all his new customers. After a while, Abraham became a very big, important and rich storekeeper. He became one of the richest men in the town. The Rebbe's blessing that Abraham should become wealthy had been fulfilled. To be rich seems mighty good when one is poor. People sometimes think that if they were rich, life would be beautiful. But being rich can be a problem too. Now that Abraham had a big store, he had a lot more work to do. He worried about robbers breaking into his store or home. He worried about his business. He wanted his store to keep on growing. He wanted a very beautiful home. He wanted new, fancy clothes. Because Abraham was busy with his store, he found less and less time for studying Torah and going to shul to pray. He did not even have time to bother with poor people. Abraham could only be seen by special appointment. His secretaries were told to give money to needy people who came for his help, but Abraham had no time to listen to their stories or problems. Abraham and his wife built a brand new house that almost looked like a palace. It had many rooms, and all the rooms were large and beautiful. On the windows hung soft velvet drapes. The floors were covered with thick rugs. There was wallpaper on the walls. The kitchen was filled with new pots and pans. There were lots of fine dishes in the cabinets. All the furniture was new and expensive. The dining room table was made of shiny wood. The chairs in the living room were soft and plump. On the walls hung paintings by real artists. And on one wall in the living room there hung a huge mirror. It was so big it almost covered the whole wall. All around this mirror there was a wide, thick frame of gold. No one else in town had such a fine mirror. Everyone who saw it spoke of its beauty. It was truly a masterpiece. There were many servants in this new house. But this house was so fancy that Abraham did not want to let beggars or poor people come in. Strangers were no longer invited for a meal. Servants would open the door and give some money to the needy, but that was all. "Abraham is different," people said. "He has changed since he became rich. What a pity! He was always so kind and good, and now look at him. He has no time for any of us any more." And they would shake their heads sadly and remember the good old times when Abraham had never been too busy to help others. Time passed. One day a messenger came to visit Abraham. He had been sent a long distance from the famous Rebbe who had given Abraham the blessing of riches. The news of Abraham's good fortune had reached the ears of the Rebbe and now he needed his help. An innocent Jewish man had been put in prison on false charges and a great deal of money was needed for his ransom. Of course Abraham was happy to help. He gave the messenger the money and sent him off with good wishes for a safe trip home. He also sent regards to the Rebbe. The messenger had completed his job, but he did not feel happy. It had been difficult for him to speak to Abraham in person. His secretaries had not wanted to let a stranger into Abraham's private office. Abraham had given him the money, but he had not invited him to his home for some food and rest. The messenger was surprised. The Rebbe had praised Abraham and often spoken of his hospitality and charitable ways. The messenger could not understand what had happened. When he came back to the Rebbe, he gave him the money and told him everything about his trip. The Rebbe shook his head sadly. He understood that Abraham, the poor man, had a heart of gold, but Abraham, the rich man, with all his gold, seemed to have a heart more like stone. The Rebbe decided to visit Abraham to see what could be done. When the Rebbe arrived at Abraham's house, Abraham welcomed him warmly and invited him into his home. This house looked very different from the home that Abraham had lived in when the Rebbe first visited him. It was big and beautiful, but gone was the friendliness and warmth one had felt in the simple, old home. The Rebbe walked on the heavy rug. He saw the costly paintings. He looked at the expensive, new furniture, and at the drapes made from the finest, softest velvet. And then he noticed the mirror. He looked at its shiny gold frame. It was the biggest mirror he had ever seen. "Quite a change, is it not?" said Abraham with a pleased smile on his face. "And that mirror, " he continued, "is my favorite treasure. Of all the lovely things I own, I like that mirror the best. It cost a great deal of money, but it was worth it. It is truly a masterpiece, a work of art, is it not?" he said and turned to the Rebbe. "Yes," the Rebbe answered. "Quite a change. Quite a change." He said this softly, in a low, serious voice, and his face looked sad. Suddenly, the Rebbe called to Abraham. "Come here," he said, and asked him to walk over to the mirror and stand in front of it. The Rebbe then walked away a bit and asked Abraham to tell him what he saw. Abraham was puzzled at this, but answered, "Myself. That is what I see in this mirror. My own reflection — that is all I can see." "Look closely," the Rebbe said. "What else do you see?" "I see my lovely furniture reflected in the mirror. I see my paintings, I see my rugs and drapes. I can see many things in my beautiful home," answered Abraham. The Rebbe then walked over to the window with Abraham. He pushed aside the drapes and told Abraham to look out into the street. Abraham's home was on a big street and people were always passing by. Since it was a small town, Abraham knew almost all the people walking past his house. The Rebbe asked him many questions about all the people they saw. And Abraham told him that the woman with the basket was a poor widow with many small children. She was hoping that kind people would put food in the basket for her family. He told the Rebbe about Bentze, the water-carrier, who was getting old and found it hard to carry the water. He pointed out Yankel the tailor, a fine Jew who went to shul every day, but was very poor and never had enough money for his family. Abraham was wondering why the Rebbe was asking him all these questions. The Rebbe was a serious man who never had time to waste. Why should he be so curious about all these people? Then the Rebbe said to Abraham, "It is strange, is it not? A mirror and a window are both made of glass and yet they are very different." "What do you mean?" asked Abraham. 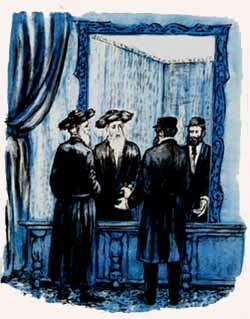 "Well," said the Rebbe, "when you looked in the mirror you could only see yourself and the things that belong to you. You could see much more when you looked out the window. Then you could see all your neighbors and friends from the whole town." "That is true," said Abraham. "A mirror and a window are both made from glass. The window is transparent. Light can pass right through it. It is clear and you can see everything through it. The mirror, on the other hand, is covered with silver on one side. The rays of light cannot pass through, and therefore a mirror can only reflect what is in front of it." "I see," said the Rebbe and nodded his head. "I see. The piece of glass that is plain is clear through and through, allowing you to see others and their lives. But when it is covered with silver, then you can see only yourself. Hm, very interesting. It is really quite fantastic, isn't it? Now do you think it will work the other way too? Could you take a mirror and scrape off the silver so that you would be able to see everyone else instead of yourself?" Abraham's eyes filled with tears. He felt so ashamed. Finally, he was beginning to understand everything that had happened to him since he became rich. That evening, Abraham made a big party in his home. The whole town was invited, especially all the poor people. Everyone had a fine time. Then Abraham asked for silence. He made a short speech and asked for everyone's forgiveness. He told his guests that he was sorry for the way he had acted after he became rich. His life would now be different. He promised them that his doors would always be open for everyone, and that he never would be too busy to help those that needed him. After all the guests had left, Abraham walked over to his beautiful mirror. With a sharp knife he scraped off the silver covering in one corner. He did not stop until that part was as clear as glass. Only then was he satisfied. what is mirroring a picture just posted on my FaceBook Page I live in an astonishing world, astonishing for all the people that occupy this world, for this diversity,even of rich and poor because poverty is not what is appears to be, and often, as we know those who have a POV that is restricted, that perceives the world through the lens of just the self, well, that is the true poverty, because we're all in this together. The wealth that is in the world itself, is free, as in nature, as in our interactions with each other, a movement towards a greater truth, of One. Great Story!!! This story is wonderful!! thank you so much Chana for sharing with us, I must say this story really opened my eyes to examine myself. As I write this post, tears are coming down..
Hashem has really blessed me throughout my life. I was the 'poor' Abraham, always helping people, reading Torah and making sure no one was in in need. I was, however, blessed to undertake a job that compensate with a high salary, my apartment is beautiful, I live in a nice wealthy area. I now see myself and what I have become. I have developed into the 'rich' 'have-no-time' Abraham, where most of my days are spend just focusing on me, on what I need, what i have, and what is next. The reminder The reminder to see beyond yourself can take many forms as the custom to see the reflection of the havdalah candle on the fingernails is one. To be a light to others one must be successful, wealth is a sign of success.